The Good Grey Lady has gone bipolar. On the one hand, the New York Times is hellbent to goose its digital subscriptions, an effort that has been aided and abetted by the election of Donald J. Trump as America’s 45th president. On the other, the Times has made efforts to boost its decreasingly lucrative print edition by producing print-only features like yesterday’s Puzzle section, which was promoted by a full-page ad in Thursday’s New England edition (although – inexplicably – it doesn’t appear in the Times Replica edition) and this press release two weeks ago. The New York Times Magazine today announced that it will produce a special, print-only Puzzle Spectacular, to appear with the Sunday, December 18 edition of the newspaper. 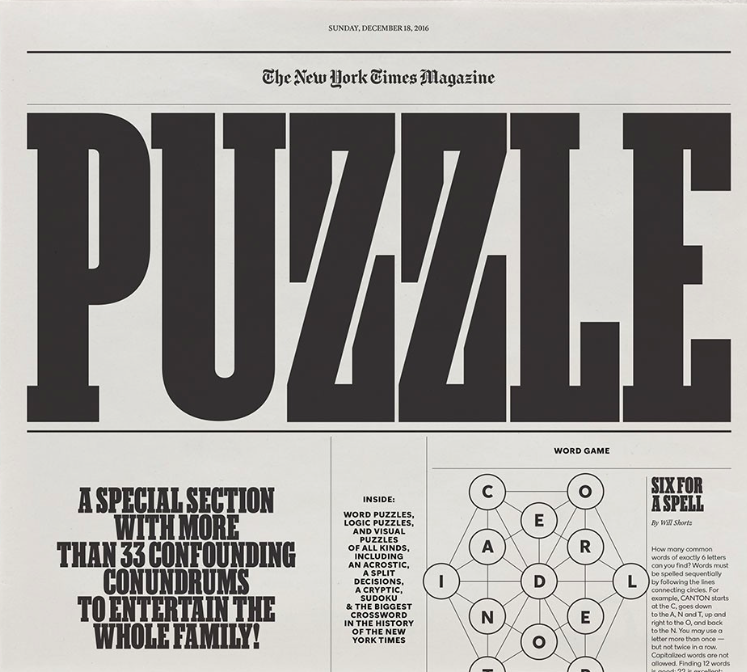 The special broadsheet section, which will be edited and introduced by New York Times Crossword editor Will Shortz and The Times’s puzzle team, will be devoted entirely to a series of different puzzles, including, as a centerpiece, the largest crossword puzzle in the history of The New York Times. That special section follows on the heels of print-only offerings of an August excerpt from Colson Whitehead’s The Underground Railroad, and April’s Fraying at the Edges, which chronicled a heartbreaking story of coming to grips with Alzheimer’s (and eventually wound up on the Times website). Respect to the Times for doing its best to get the print edition off life support. But, sadly, it’s just whistling past its own graveyard. This entry was posted in Uncategorized and tagged Alzheimer's, “The Underground Railroad”, Colson Whitehead, digital subscriptions, Donald J. Trump, Fortune, Fraying at the Edges, Good Grey Lady, New York Times, Puzzle Spectacular, Will Shortz. Bookmark the permalink. The real puzzle for the Times, John, is how they will “recalibrate” their news reporting and editing to offset the relatively “deplorable” coverage of the 2016 election season. There is a lot of egg all over the faces in that newsroom. And then there’s Liz Spayd’s observation, somewhat covered over by the egg wash, of the lily-white nature of the employee roster. Yeah – Spayd’s column was a real woodshed moment, Mudge. As for their coverage, maybe the new crowdsourcing initiative I noted today will help.